Have you ever wanted something so badly but couldn’t envision yourself getting it? Maybe you want to produce your own comedy web-series, or play the Greek Theatre in LA, or have your novel published; whatever it is, sometimes we can imagine these things in the abstract, but when pressed to consider the reality, the vision is hazy at best. If this sounds familiar to you, you’re not alone — I encounter this “syndrome” all the time when coaching, and there’s a very simple antidote to it. It’s called “Assuming Success.” Assuming success is exactly what it sounds like: believing deep down that you will accomplish what it is that you set out to do. Period. I know, I know, right now you’re probably thinking, “Uh, Betsy. That’s it? There must be something you’re forgetting, right?” Well, my friends, that IS all there is to it, but the simplicity of it can be a little deceiving. Otherwise, we’d all be assuming success and wouldn’t have to talk about it. Call your shot. And back it up. The thing is, it can be difficult to assume success for a variety of different reasons. Some people think they don’t deserve it. Others think they’re not ready for it. And there are those that just never even considered success as a real possibility. Whatever the reason, they all come down to playing it safe because you don’t have to move outside of your routine and comfort zone — you can just keep on doing whatever it is that you’ve been doing. However, when you assume success, you’re setting yourself up to achieve it and that switch in perspective can often times push you into some new territory. While that territory can be a little disconcerting at first, believe me, it’s a VERY empowering place to be! Once you get used to the feeling you’ll find a newfound sense of confidence, which will affect every aspect of the way you run your business (not to mention the effect it will have on your life as a whole). You’ll want to make those phone calls that you were a little too timid to make. You’ll charge forward with that creative project that you thought might not appeal to the masses. You’ll take the disappointments in stride because you know that they’re just bumps along the road to the success you’ve envisioned for yourself. 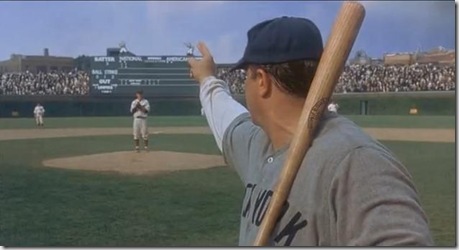 This is about having your Babe Ruth moment: pointing to the center field bleachers to say, “That’s where this ball is going,” and having the confidence to back it up. So…I’m going to leave you all with the challenge of assuming success for yourself. It can be for something big or small — I don’t care what it is, as long as you dig deep and really, TRULY believe that you can accomplish it. It may feel awkward or uncomfortable at first (or not! ), but just see it through. Trust me: a simple change in perspective can change everything.